is the best you can put together under 30 mins and your dinner is sorted! 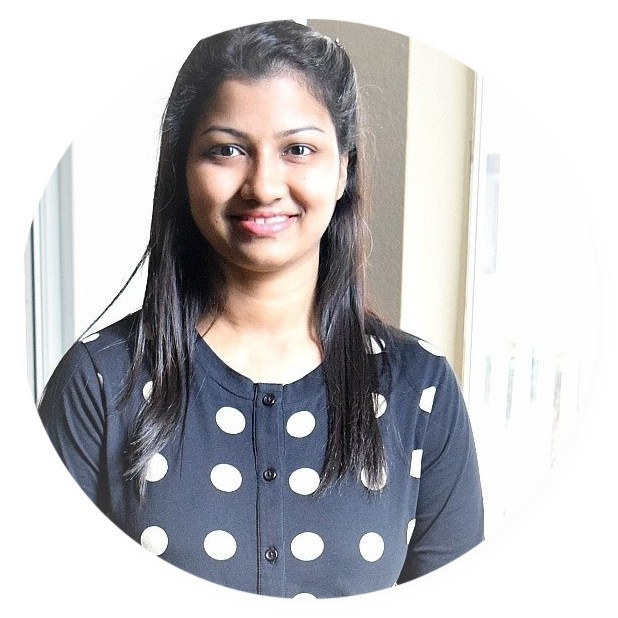 What you do when you crave for Restaurant-style food? Specially the Chinese takeout food? oh I would dial my favorite restaurant which gives the best Chinese food. So instead of spending so much on outside food I cook this easy Dinner/Lunch and superbly yummy,best under 30 mins Shrimp Fried Rice! 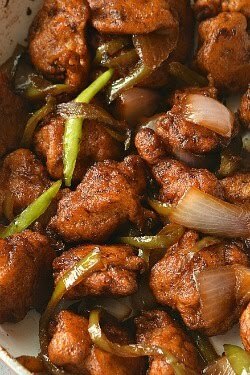 If you are a Chinese takeout food lover then try this very easy,delicious and can be put-together under 30 mins BEST FRIED RICE recipe ever. This recipe of fried rice is very easy to put together and will ease out your nightmare of cooking restaurants style food in no time. 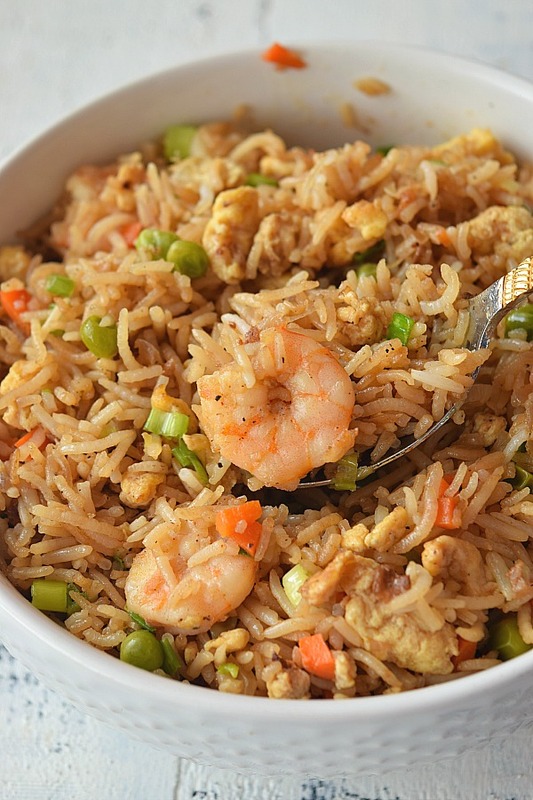 Shrimp fried rice tastes amazing when cooked with fresh shrimp instead of frozen ones. Its time consuming or you are running on the clock time and can't waste time cleaning shrimp so go ahead and use the frozen ones,no harm. I cook many recipes with frozen shrimp but this time I used fresh shrimp. I love takeout food but that is so much money for so less to protein you will get in a takeout portion. 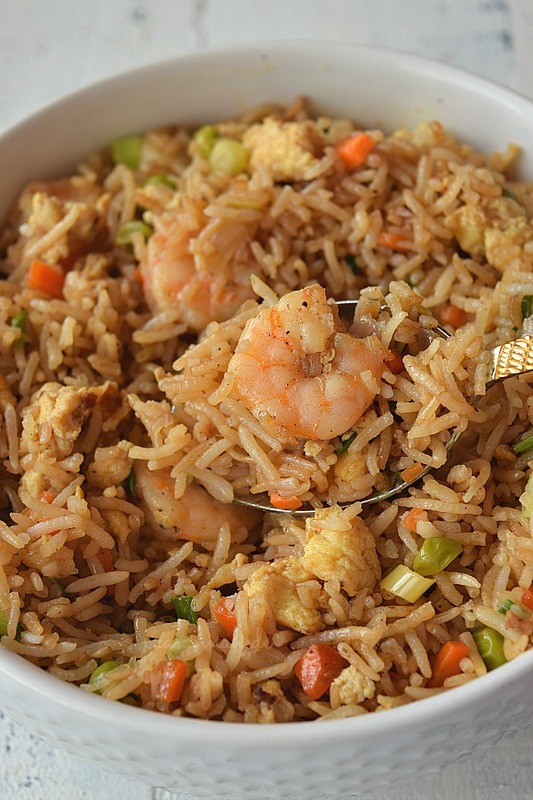 There will be hardly 3 to 4 shrimps in a single portion of fried rice but when you cook at home you will be able to add as much quantity of protein you like. This recipe is very customizable - add your choice of protein,seafood you like- go for Chicken/Pork/Beef or Squids/Clams/Mussels you like to add. Also add whatever veggies you have in the refrigerator- use corn kernels,frozen vegetables whatever you have,cauliflower,cabbage,bell peppers- just add what you like and it will be still so amazing. Soak the rice at least for an hour and then cook it. 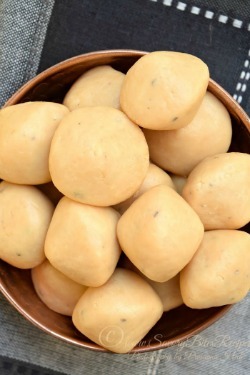 Refrigerate rice before using in this recipe. Preferably cook the rice the night before when you plan to cook the fried rice. If the refrigerated rice is hardened to form lumps then just break the rice lumps lightly with hands before using it in the recipe. In a mixing bowl,mix together all the ingredients for the sauce. In a separate bowl whisk eggs,salt,white pepper powder with little rice wine vinegar. Always cook vegetables on high heat in a work or any kind of deep pan would work but make sure you have applied oil to it well or else rice will stick to it. 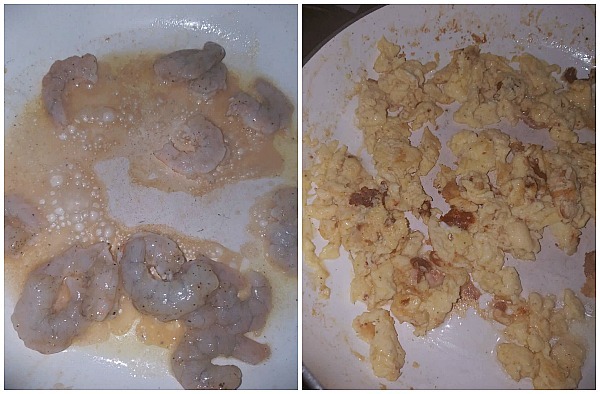 In a pan,add butter and fry the shrimps marinated with salt,black pepper powder and a teaspoon of sauce mix. Cook till shrimp are soft and cooked well. Keep them aside. In the same pan,add little more butter and add the eggs and scramble them into tiny pieces and keep aside. In the pan,add sesame oil or vegetable oil + butter,add the veggies,toss them till soft,add the rice,shrimp,eggs and sauce mix and cook/toss them on high heat till its well cooked. 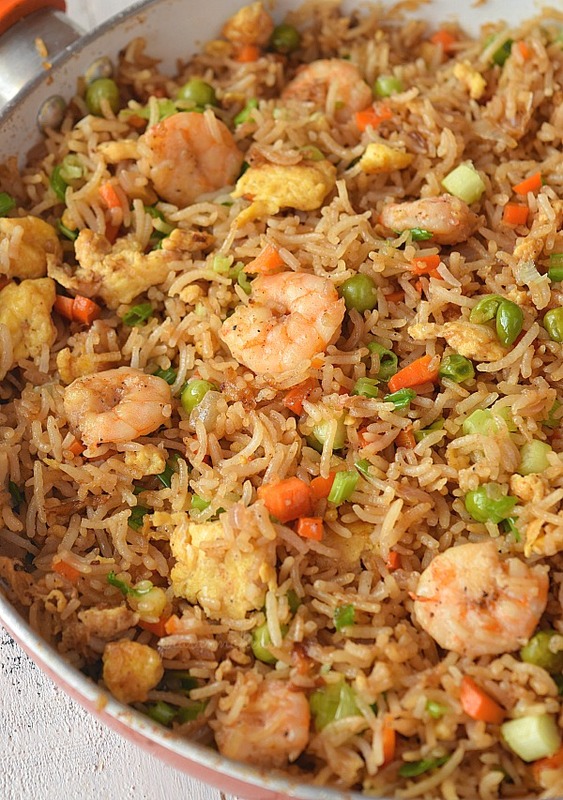 What are the ingredients of Shrimp Fried Rice? 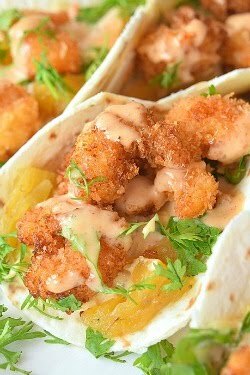 Shrimp: Use the best shrimp you can get your hands on.Fresh one's are best but frozen ones are not any less.Plus using frozen ones will save so much on time and money too.Fresh shrimp are pretty expensive and frozen ones are not that much.For this recipe use small to medium sized shrimps. Eggs: Scramble eggs on high heat for that extra flavor in this fried rice. Peas,carrots or any veggies you like: I have used frozen peas and carrots chopped.You can use use any veggies you like.Try adding thinly sliced cabbage,sliced green bell pepper. Rice: Try using Jasmine Rice or any rice which cooks well but wont get mushy.You can always try Basmati rice too but do not overcook it. 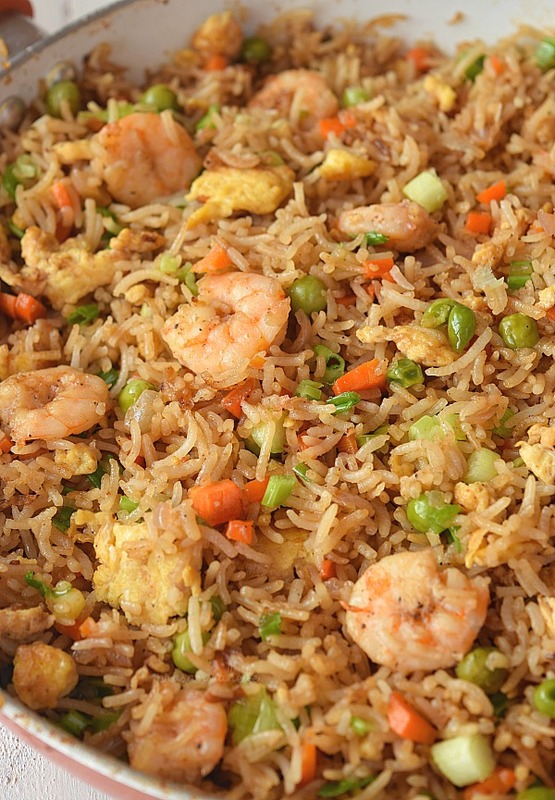 Sauce Mix: Sauce mix is the key to perfect fried rice.May be its Chicken Fried Rice,Egg Fried Rice or any Seafood Fried Rice, sauce mix is the key to get the right fried rice. 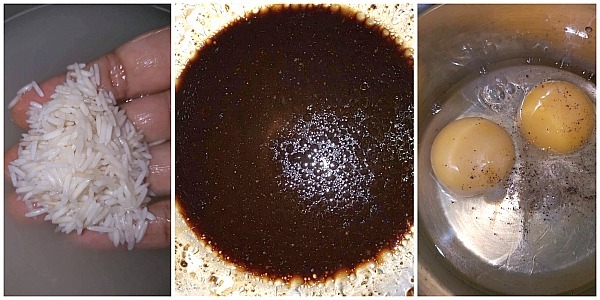 Here I have mixed Sesame Oil,Brown Sugar,White pepper Powder,Rice Wine Vinegar,Oyster Sauce and soy sauce. 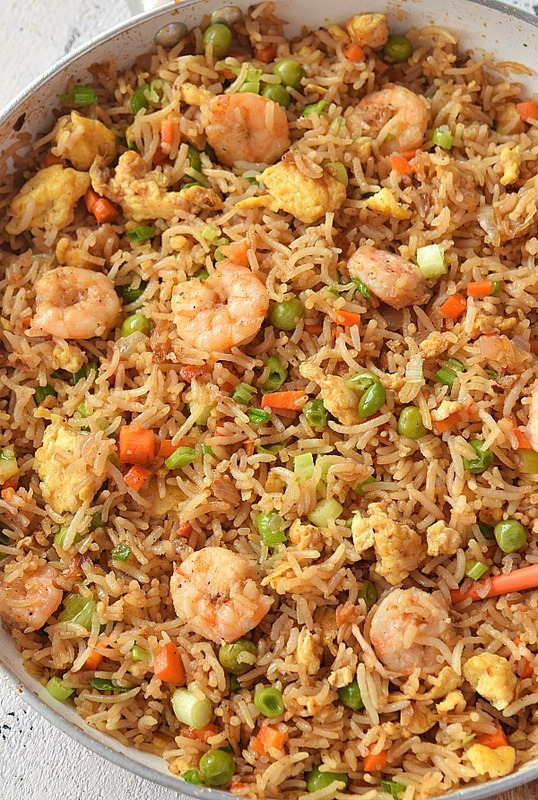 Best Fried Rice recipe you can try and easy to put together,under 30 mins you will get Better Than Takeout ,Restaurant-Style Shrimp Fried Rice! Loaded with Shrimp,peas,carrots,and flavorful sauces,makes your lunch/dinner sorted in no time. Soak rice before cooking atleast for an hour. Cook rice night before the fried rice to be prepared and refrigerate it. In a bowl mix ingredients to make sauce mix. In another bowl whisk eggs,salt,pepper powder and rice wine vinegar. Marinate shrimp with salt,pepper powder and sauce mix. In a pan,add 1 Tbsp Butter,add the shrimp and cook till pink and cooked. Keep aside. In the same pan add the eggs and scramble to make tiny pieces. In the same pan add another 1 Tbsp Butter and Vegetable Oil / Sesame Oil,add the ginger and garlic, and toss till they are fragrant. 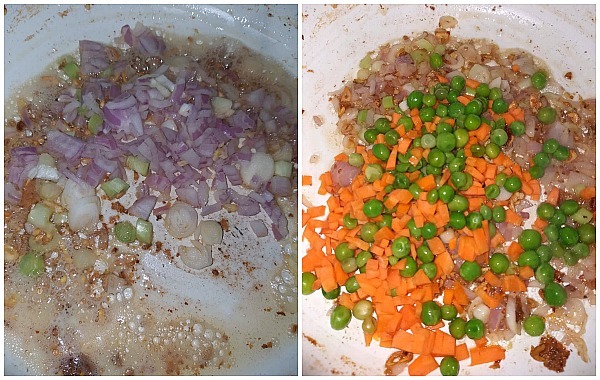 Add the onion and vegetables and cook till soft. Add the rice,shrimp,eggs and mix well. If the rice is cold and formed lumps due to refrigeration then lightly break the lumps without breaking rice. Add the sauce mix and mix well. On high heat toss well till rice is cooked well along with rest of the ingredients. Sprinkle some water over rice,cover and cook for some time. Finally add some more oil if you need and top with spring onion greens. 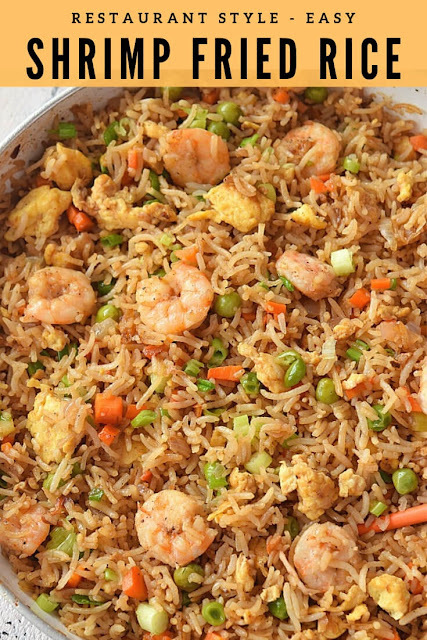 Can I refrigerate the leftover Shrimp Fried Rice? Yes of course! 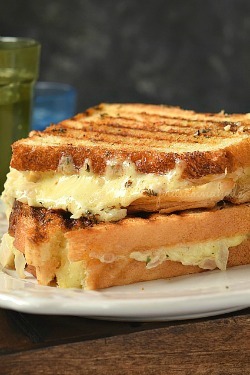 Just refrigerate in a bowl/container and reheat in microwave as and when you want to use it. 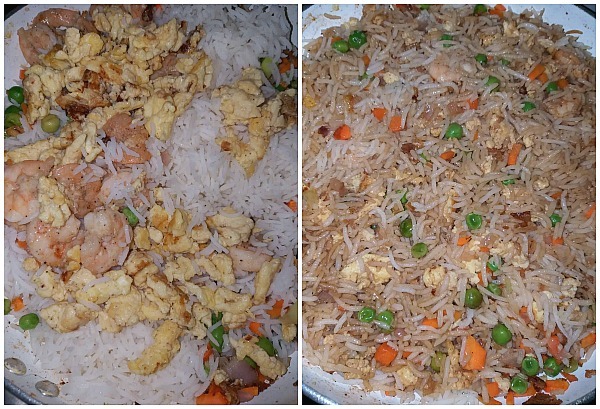 Do not refrigerate for more than 3 days as there are chances of rice getting spoiled.